Regulation (EU) 2016/679 of the European Parliament and of the Council of 27 April 2016 on the protection of natural persons with regard to the processing of personal data and on the free movement of such data, and repealing Directive 95/46/EC, referred to as GDPR, becomes effective across the European Union on 25 May 2018. 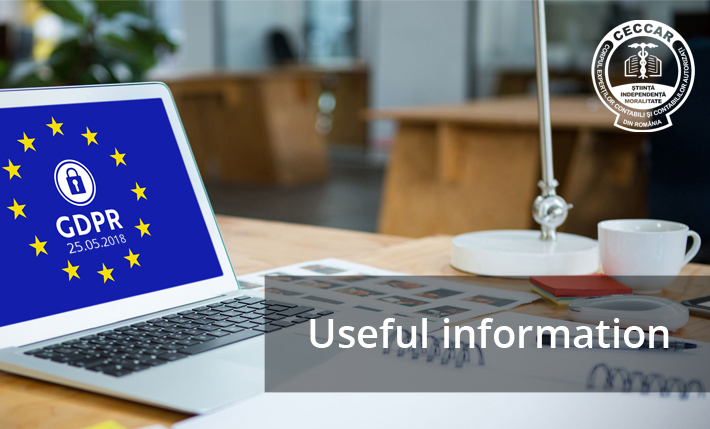 Accountancy Europe published a factsheet to help accountants understand the impact of the new rules on their activity. The new rules bring more rights for citizens: the right to information, the right to access personal data, the right to correct and erase (the right to be forgotten), the right to restrict processing, the right to data portability, the right to object. Additional information is available on the National Supervisory Authority For Personal Data Processing. The institution also developed Guidelines for the application of the General Data Protection Regulation.